Fatah’s Central Committee welcomes anti-Israel resolution at the UN, vows to intensify its efforts to establish a Palestinian state. 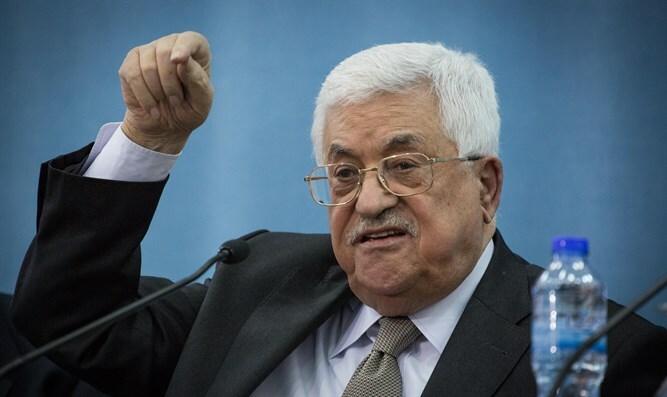 Palestinian Authority (PA) chairman Mahmoud Abbas’s Fatah party on Monday welcomed the anti-Israel resolution passed last week by the UN Security Council and vowed to intensify its efforts to end “Israeli occupation”. "The door remains open to international activity meant to establish the national rights of the Palestinian people towards strengthening the efforts that aim to end the occupation and establish a Palestinian state with its capital in East Al-Quds in the 1967 borders," said Fatah’s Central Committee following a meeting in Ramallah. In the coming week, Fatah is scheduled to mark the anniversary of its establishment with a series of events that will mark the UN's support for the Palestinian Arab position on Israeli communities in Judea and Samaria. Associates of Abbas, emboldened by the passing of the resolution, have already declared their intention to sue Israeli officials at the International Criminal Court in The Hague. “In 2017 we will go to The Hague,” Palestinian Arab journalist and Abbas aide Nasser Lahham told Channel 2 News on Sunday. "We have hundreds of pages with names of IDF officers. Every pilot and every officer and every soldier, we have his picture, his name, and we are waiting for him at The Hague. If we succeed in just one case, it's a different world,” added Lahham. In addition, Fatah's official Facebook page posted a picture of "Palestine" with the words "thank you" added above the names of the 14 countries which voted in favor of the resolution at the Security Council. A puddle of blood was added to the bottom of the picture.